Even though it is mid-October, I am still bringing home my favorite late summer vegetables from the farmers’ market (eggplant, tomatoes, summer squash and peppers). Unfortunately, the weather has cooled to the point that more often than not I’m not in the mood for the dishes I usually prepare with these foods. Still, because these vegetables are still so beautiful…and because I’m not quite ready to let summer go for the year, I continue to purchase them. Fortunately, these vegetables also lend themselves to a few treatments more appropriate for the cooler days of early fall Favorites like ratatouille, moussaka, and eggplant, pepper & chickpea stew are all likely to appear on my table during the cooler days of September and October. 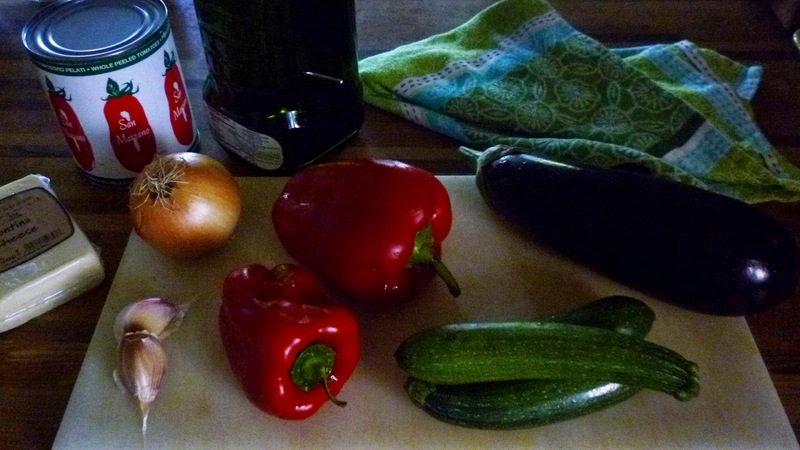 Most of the aforementioned dishes are a bit time consuming to make…ratatouille (my favorite), in particular. And, as I mentioned in my last post, my schedule has been pretty busy of late. Consequently, I haven’t had the time to make a big batch of ratatouille this year. 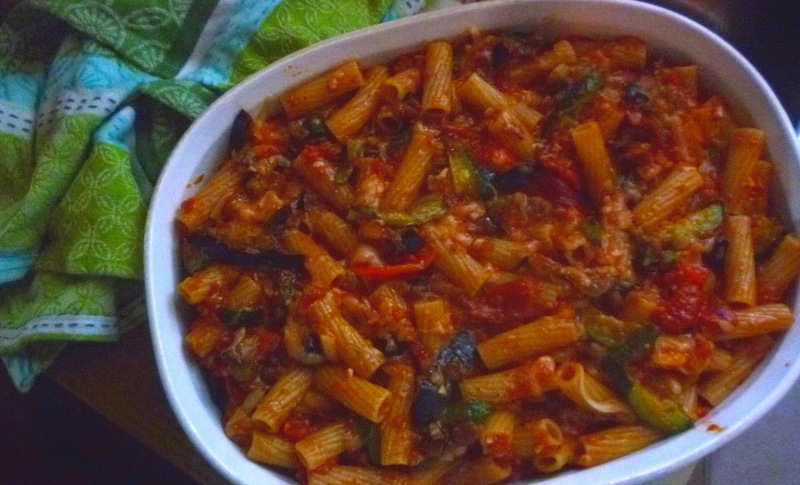 But this past week I was still able to satisfy my craving for the flavors of ratatouille by making a relatively quick baked pasta that uses the same combination of vegetables. To make the pasta, the eggplant, peppers and squash are simply roasted and then combined with pasta, cheese and a quick tomato sauce. It could hardly be easier. I should mention that the tomato sauce is quick because it uses canned tomatoes. I’m still bringing home beautiful vine-ripened tomatoes from the market, but their supply is dwindling to the point that I only want to enjoy them raw since I know it will be many months before I can have them that way again. Good canned tomatoes (use imported San Marzanos, if you can) make a very nice sauce. And if you happen to have a couple of cups of homemade summer tomato sauce in your pantry or freezer, you can of course use it in this dish (it would be super delicious). 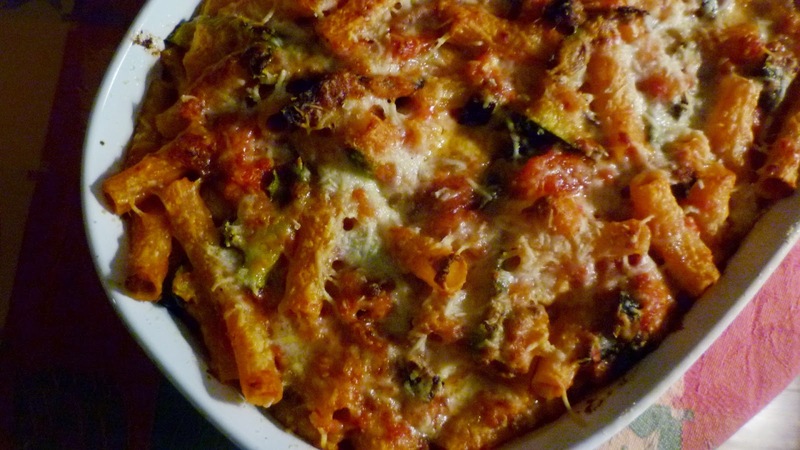 My baked ratatouille pasta really hit the spot. It doesn’t have the rich depth of a long simmered ratatouille, but on a cool night—in the midst of a busy week—it tasted oh-so-good… perfect for my mood….and the season. Warm a couple of tablespoons of the olive oil in a shallow saucepan set over medium heat. Add the onions along with a pinch of salt and sweat, stirring occasionally, until softened and golden—about 10 to 20 minutes (add more oil if the onions seem dry). Add garlic and cook until fragrant—about 2 minutes. Pass the tomatoes, along with their juice through a food mill fitted with the coarse disc (or pulse in the food processor or simply break up with your hands). Add the tomatoes along with salt & freshly ground pepper to taste. Simmer sauce, uncovered, stirring occasionally, until thickened—about 20 to 30 minutes. Taste and correct the seasoning with salt. When finished, you should have about 2 cups tomato sauce. While the sauce cooks, prepare the rest of the vegetables. Top and tail the eggplant and zucchini. Cut the eggplant lengthwise into 1/2-inch thick slabs, then crosswise into 1/2-inch sticks. Slice the zucchini on the diagonal a scant 1/2-inch thick, then slice into strips so that each piece resembles a quill shape. Toss the eggplant and zucchini in 2 to 3 T. of olive oil and season with salt & pepper. 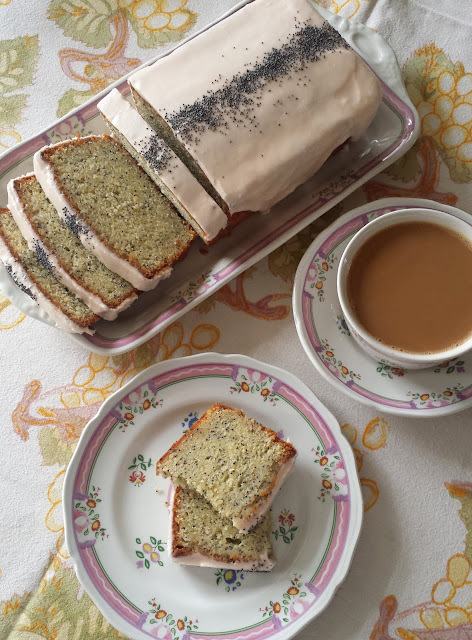 Spread the vegetables on a rimmed baking sheet (if your baking sheet is too crowded, divided the vegetables between two sheets and rotate the pans from front to back and top to bottom half way through the cooking time). Roast the vegetables at 425° to 450°. Do not stir the vegetables until they have begun to take on some color—and then do so carefully, using a pancake turner-type spatula to scoop the vegetables off the sheet and turn them over. You should only need to stir once...if at all. The vegetables are done when they are golden and tender—about 20 to 25 minutes total. While the vegetables roast, cut the peppers into 1/2-inch strips. If the strips are very long, cut them in half horizontally. Set aside. Bring a large pot of water to the boil. Season well with salt (it should taste salty—you'll want at least 1 to 1 1/2 teaspoons per quart of water). Add the rigatoni and cook until almost al dente (pastas that will be baked should be a bit firmer than those that will be sauced and served right away), drain. 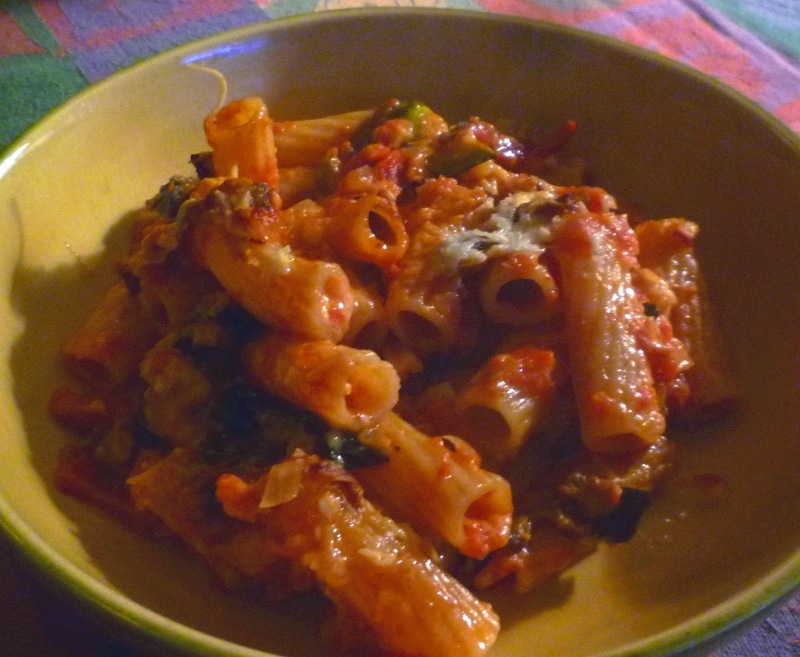 In a large bowl, combine the pasta, tomato sauce, eggplant, zucchini and peppers. Stir to combine. Add the Fontina and fold in just until evenly distributed—the cheese does not have to melt. Transfer the mixture to an oiled 2 1/2 quart shallow baking dish. 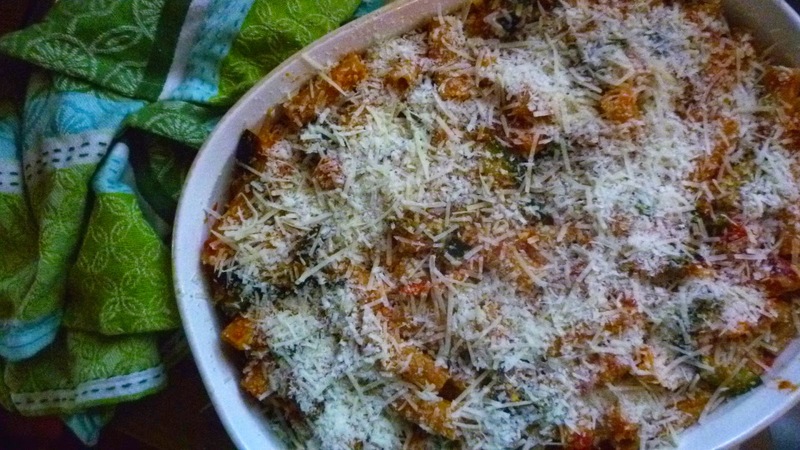 Scatter the Parmesan and Pecorino over the top. Transfer to a 375° to 400° oven and bake until hot through, tinged with brown on the top and bubbling around the edges—about 20 to 25 minutes. 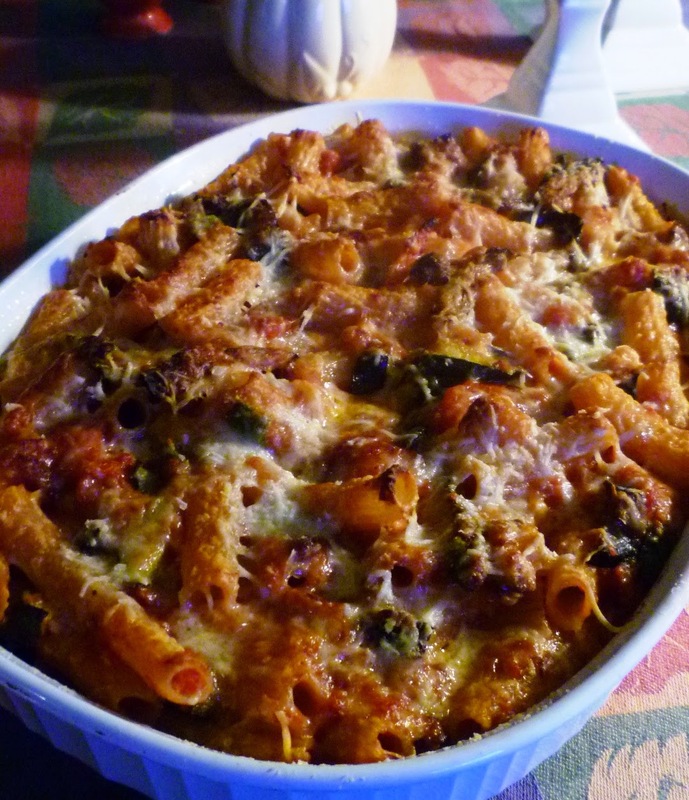 For even more browning, run the pasta under the broiler after it is hot through. Serves 5 to 6. Variation (30 Aug 2017): If you like, you can replace the canned tomatoes with fresh. Use 2 lbs of vine ripened tomatoes. Core the tomatoes. Halve them horizontally (through their equator). Using a large-holed grater set on a plate or pie pan, grate the tomatoes by holding the cut side of the tomatoes against the grater and grating until just the skin remains in your palm. Add the fresh tomatoes exactly as you would the canned--there is no need to run them through a food mill. Variation (6 Sept 2018): I had everything in the house to make this pasta...except I was short on Fontina (and even Fontina-like...ie good melters...cheeses). So I made it anyway and made up the difference by spooning blobs of whole milk ricotta over the surface before the final scattering of Pecorino/Parmesan. I think I used 2 or 3 oz. of ricotta. It was delicious!